Officially Update Galaxy S7, S7 Edge to Android 7.0 Nougat . 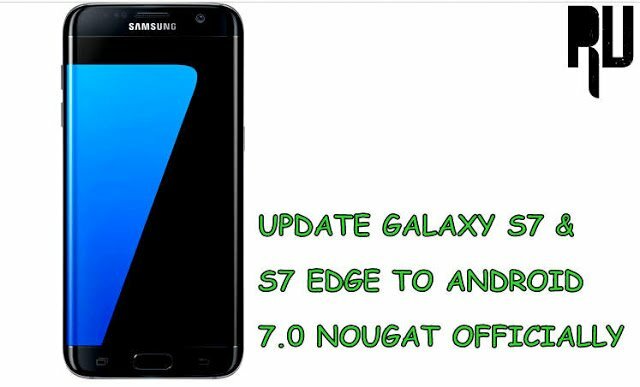 How to Update Samsung Galaxy S7 And S7 Edge to Android Nougat 7.0 Manually . 1 How to Update Samsung Galaxy S7 And S7 Edge to Android Nougat 7.0 Manually . 1.1 Download Nougat 7.0 Firmware for Galaxy S7 / S7 edge . 1.1.1 Step by Step Guide to Update Galaxy S7 / S7 Edge to Nougat 7.0 officially . Do you want to Update Samsung Galaxy S7 Edge and S7 to Android 7.0 Nougat officially ? if yes then you are at right place . Now you can Download Official Nougat firmware for Galaxy S7, S7 edge and flash it on your device manually . Samsung Galaxy S7 and S7 edge both are the latest flagship devices of Samsung and the company is also planning to Launch the New S8 in coming days . We already shared the list of Samsung Devices getting Android 7.0 Nougat Update And botgh the S7 and S7 edge are in the list of official nougat update . Samsung released the Full nougat firmware for S7 and S7 Edge and now users can Download it and flash on their devices . Download Nougat 7.0 Firmware for Galaxy S7 / S7 edge . First of all Make sure there is more then 65% in your smartphone . In about Phone you will See ” Check for Updates ” Option . Now The app Will start Downloading Update . Thats all !! Just install and Enjoy Nougat Update on Galaxy S7 / S7 Edge . Related : List of Android Nougat 7.0 Custom roms for Popular phones . This Guide is for Samsung Galaxy S7 / S7 Edge . Make sure there is more then 50% in your smartphone . There should be more then 4Gb free space in your phone . Active internet connection is required to Download Firmware . ODIN is required to flash the firmware on device . Step by Step Guide to Update Galaxy S7 / S7 Edge to Nougat 7.0 officially . 1) First of all Download official Nougat Firmware for Your Devices , Samsung Galaxy S7 Nougat Firmware / Samsung Galaxy S7 Edge Nougat Firmware . 3) Now Connect your S7 / S7 Edge to Computer . 4) Now you have to Boot your smartphone in Download Mode . 5) To Boot in download Mode press Power + Volume Down + Home button Together . 6) Dont Release the keys until the smartphone boots in Download mode. 7) Now The ODIN toll Will recognize your smartphone . 8) Now you have to go to the Download folder and Select the firmware file which is In ( .tar / .md5 ) format . 9) Now in Odin toll Enable the ” Auto restart ” and ” Reset time ” Options . 10) Now tap on Start . 11) The process will take around 3 Minutes to complete . 12) Once the process gets completed you will See ” PASS ” Notification on your Pc . 13) Now your S7 / S7 Edge will automatically start rebooting . 14) The first boot will take around 5-7 Minutes . 15) Thats all !! You have successfully update Galaxy S7 / S7 Edge to android 7.0 Nougat . So this was our guide on How to update Samsung Galaxy S7 and S7 edge to android 7.0 Nougat officially , I hope this guide Helped you .